Carl White is a TV Personality, Producer and Columnist. This book features a collection of syndicated stories written in his voice about the people and places of the Carolinas. Whether it’s the historic doorknobs of Old Salem and how confusing they can be for some people or a random conversation at a country diner with a Veteran about his service in Vietnam, Carl spends his time doing what he enjoys most, sharing real stories with viewers and readers. Did you know that Edgefield, SC was the home to ten SC Governors? Or that world-renowned Jazz musician Dizzy Gillespie was from Cheraw, SC? What about those mysterious Brown Mountain Lights in the North Carolina Mountains? They have kept people guessing what they are for hundreds of years. Discover the beauty of the brackish Waccamaw river and learn about the massive live oaks that predate the founding of America. In Gold Hill, NC we make a connection with the past learning about the early days of gold mining in America. In days past, the mayor of Charlotte, NC once said that he hoped that Charlotte would someday be as prosperous as Gold Hill. These inspired stories of the Carolinas and many more appeared weekly in Newspaper Print throughout North and South Carolina and have now been curated in volume one of This Weeks Words. Have these inspired stories delivered directly to your doorstep and discover the people and the places that make the Carolinas great. Start reading these inspired stories today on your preferred device! Carl White occupies a lofty position as the most effective voice of North Carolina's commendable heritage. This collection of warm essays honors the folkways of this diverse state, showcasing places, people and events that otherwise likely would have been overlooked. 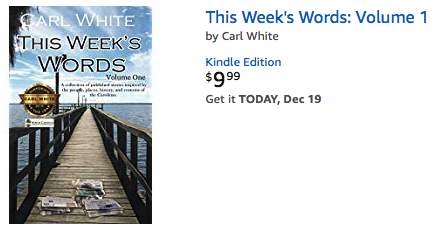 Just in time for Christmas gift giving, Mr. White's noble work would be a perfect stocking stuffer.